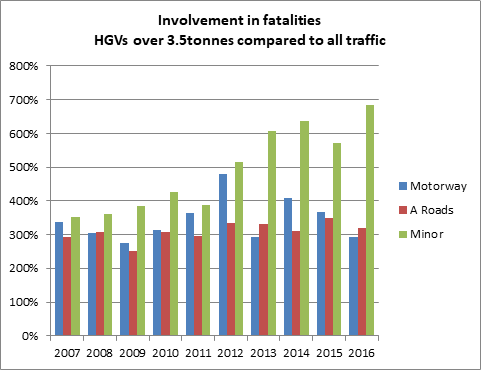 Campaign for Better Transport has compiled figures for the last ten years which show that in 2007 HGVs were three and a half times as likely as cars to be involved in a fatal collision on minor roads, despite making up only five per cent of overall traffic. However, last year’s (2016) figures show that this had doubled, with HGVs almost seven times more likely to be involved in fatal crashes than cars. The figures show the involvement of HGVs in fatal crashes compared to all other vehicles on motorways, A roads and minor roads for the last ten years. They reveal little or no improvement in the rates of fatal collisions involving HGVs on motorways and A roads, and in the case of minor roads, HGVs involvement has doubled making them seven times more likely to be involved in a fatal collision than cars. Philippa Edmunds, from Campaign for Better Transport, said: “Despite making up a small percentage of overall traffic, HGVs are involved in an unacceptably high number of fatal road traffic collisions and these figures show things are not improving. Whilst cars are getting safer, HGVs continue to be extremely dangerous in a collision. There are far too many large, heavy lorries on roads which are often totally unsuitable for them, as the high rate of crashes on minor roads shows. Figures quoted are below. You can see the full ten year data here.